Cool building desgin lots of congruent lines. I completely disagree!! This is beautiful and amazing! Wow, I can't believe this is the house of the Lord. This is so beautiful! I would love to go there someday. I agree with you Arthur, it does give the chapel a very artistic look while supporting itself. This chapel is very symmetric with many similar triangles in it. The triangles in the Wayfarers Chapel Glass Church I think are mainly used to support the weight of the glass. The triangles also all come together to make one larger one. My brother thought that the triangles used were really just to give the chapel a better and more artistic look. However I know that the architect was trying to make this a beautiful church with geometrical roots. its beautiful and i but i bet it gets so hot inside...and most people dress up to go to church....i have a scion tc and that glass roof heats up quick...i cant imagine a whole buildings roof. This Glass Church is beautiful. The architecture is outstanding and it helps you see how geometry is related to everyday scenarios. The triangles preform as a sustaining support for the glass forming this church. Building this church must have taken some serious time and precision. It would seem difficult to be able to build those obtuse triangles with the structures to support the walls and the ceiling. For Lloyd Wright, he has precisely angled all of these things correctly. Beauty and structural strength. Remember geometry? I think that triangles in this church must have been used simply for beauty. They seem to serve no other purpose. I bet it is a beautiful place to be. And i think the triangles also are a sign of unity. Also a sign of power, that everyone is united in the church. The Triangles probably mean unity within the chapel. The triangles are used to hold up the structure together as well. But the beauty of this chapel is absolutely beautiful and when the sunset is at it's peak it is probably the most beautiful place to be. Yes true, without the triangles it wouldnt be really able to keep its structural integrity fully intact. This is for an FLVS assignment, hah! I agree with you! You can totally tell that he look his time within the church. I love the glass and the way that during the sunset you can definitely see it shine through the glass. Lloyd Wright took his time making this so the people inside would get a warm feeling from being inside I believe. I love the use of the same triangle just smaller. He used the same triangle just "similar" in the forms of the architecture. Lots of obtuse triangles fitting within other ones. Waleska, I agree. Its very creative and pretty. 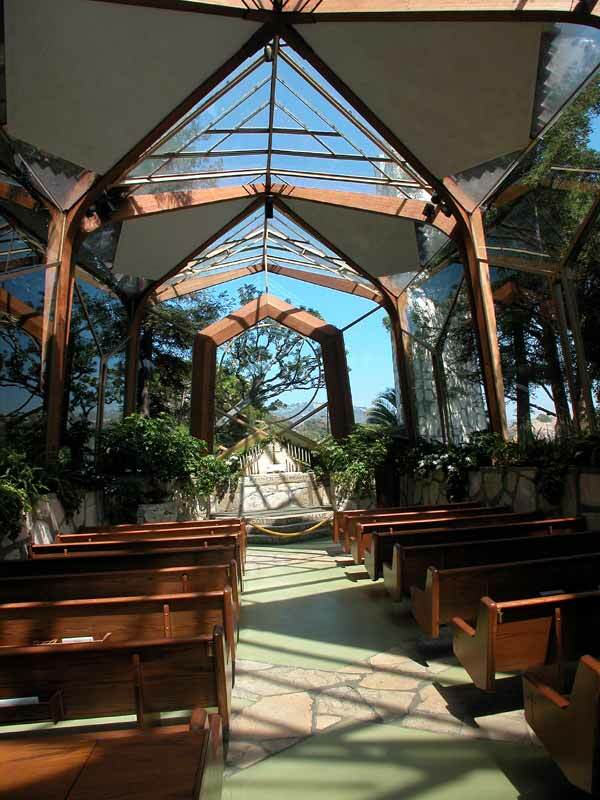 Wayfarers Chapel, also known as "The Glass Church" is located in Rancho Palos Verdes, California. It is noted for its unique modern architecture and location on cliffs above Pacific Ocean. As with many of Wright's buildings, the chapel features geometric designs and incorporates the natural landscape into the design. The triangles in the roof are getting smaller when they get closer to the middle of the biggest triangle that makes kind of a frame. It makes the design very pretty; its very uniform and makes the building more strong. Racheal, I agree. The triangles give it a different dimension and unique architecture that makes this church a one of a kind. i think the triangles help support the chapel while adding more light, and a pretty design, and i think that the acute triangles come together to form a square which is very creative. and its located in Palos Verdes Peninsula. this church looks sooo beautiful...where is it located? The Wayfarers Chapel Glass Church is beautiful!! I love how it looks like its in a jungle the designer did a great job. The church just looks amazing you can tell Lloyd Wright enjoyed building it. Most of the church sealing has acute triangles with glass build in to it so you are able to see the sky and it just makes the church brighter. the congrent triangles make the roof work. it opens up the roof and has a pattern . The use the triangles as support. The use of triangles in this structure is amazing! This is so beautiful! I am using this building for Geometry and explaining the importance of congruent triangles. This place is amazing...God is so good! Wow, this is amazing. I am doing report for geometry and have decided to use this because it is so gorgeous. It is very beautiful, I think it would be wonderful to go to it all alone at sunrise and pray. And at sunset gather in it to worship the Lord with our brothers. i found this chappel to have very creative patterns, especially with the use of its congruency of triangles. The perfect place to see God's creation and worship Him. Amen. This is the most amazing and beautiful church I have ever seen. Just... wow. The architecture of this building is just amazing it blows my mind. Very pretty.I bet it gets warm in there during the day tho. Its kinda like a greenhouse. lolz...hi Classy Cassy =) we know eachother lolz. I am also writing a report for Geometry and I fully agree with Classy Cassy. This beautiful and remarkable place truely represents God's power of creation. I am writing a report on this for Geometry. This place is so beatiful! I love the fact that the beautiful windows showcase God's Indescrible Creation. In the Wayfarers chapel which was designed by Frank Lloyd Wright the triangles are used to space out the beams to make more of an opening to let in light but also used to support the two adjacent beams next to it and connect them to other triangles which are acute to form a square. On the ceiling of the chapel there is a big obtuse triangle with a bunch of smaller triangles fitting in the big one. It is all designed to used triangles as a way to hold the structure together which is very creative.My mom gave me an idea as to use triangles as actual beams themselves and to have other triangles fit those beams together but the problem is finding the right type of material that could support that weight and design. The Church is very close to an area of Palos Verdes called Portuguese Bend which is very unstable. Fortunately the land that the Church sits on appears to be quite stable and there is not viewable damage that I can see. Jayne Mansfield was married in this church. the last time I heard anything about it it was involved in the movement of the land and that it would eventually be destroyed, is it still in usable condition, it is a beautiful work and it is in Palos Verdes Ca not Fla.
To jasmine - The church truly is a sight for sore eyes. Its amazing its located in Florida. The 30 St Mary Axe building is composed of verticle angles all throughout the structure. The verticle angles allow the building to have a rather versatile and unique shape. The vertical angles also help the building by giving it graceful symmtery. These triangles are manipulated to stand out by the coloring of the triangles and the direction the patterns go in. It's an amazing site, very beautiful! No wonder I'm choosing this art for my paper. The Church is located on the Palos Verdes Peninsula (near San Pedro, CA) close to an area known as Portuguese Bend. Wow thats pretty I am glad I chose to do my project on the Wayfarers Chaple its a beautiful sight. It is a very beautifyl. i have never seen a church like thisone. im studying the dimensions and angles for geometry. i am going to the church in real life next weekend.!!! OMG Im not christian but this place is beautiful! That's crazy. I believe there is a small chapel somewhere near Twin City, Georgia constructed of glass circles and rectangles, very much like this one. this church is really amazinq.OMG!..Im actually writing a paper on it now..
Palos Verdes Peninsula, just past Portuguese Bend, or just before if you are coming from the west side. where is this beautiful church located at? OMG!!!!!! when i first saw it i thought it was a gorgeous house but then i saw the rows. where is this at? its georgeous! wow! how beautiful! i bet that god fills that place!! For mr. Lloyd Wright, for all those people saying this church was a waste of money I would have to absolutely disagree. If u've got the money, why not build a MAGNIFICENT church like this just for the Lord. And u know with at least 6 churches a day which Im guessing doesnt come cheap, u know it makes money, and a portion if not most of THAT money can go to charity. God can be close to his people anywhere, why not here? this is an amazing structure i cant beleve the shapes of the glass its amazing. I've got to say, this church is absolutely amazing. But, I think I'm going to have to agree with Daniel. As he said that God doesn't need a million dollar church to be close to us. Instead of spending all that money on such a beaytiful church, it could have maybe gone to charity. I know that's how I would have done it. Dispite all this, I still think this is one of the most beautiful churches I've ever rested my eyes upon. The church is primarily used for weddings. It is not unusual for this non denominational Christian Church to host 6 or more weddings on a weekend day. To be sure it is a moneymaker. It is as beautiful as beauty could portray, but, It is a complete waste of money, I would much rather put that money towards a nice facility that holds a desent amount of people (for a church) and bank the rest. God does'nt need a million dollar facility to be near his people, he would rather that money was put to some real kingdom work and his people just met in a shack. no offense to Mr. Wright, but I just thought I would voice my oppinion. But it is a really beautiful place. GORGEOUS!!! ONGOODNESS!!! HOW BEAUTIFUL!!! that is something that appear to have come directly out of God's own hands! Beautiful!Only He can create such Beauty! have any of you guys herd of the book called "THE WRIGHT 3" by blue balliet. her book talks about a house that loyld wright built a long time ago that was going to be demolished. thats how i find out about loyld wright. but i think this chapel is very beutiful. although beautiful, i bet it gets rather warm in there. I have many other (better) shots in my galleries here. Beautiful! I'm going to write a paper about it!! Ive been there and its wonderful. nice picture! WOW I Bet the presence of the Lord is in that place. Its soooo beautiful and amazing. WOW! This is how a chapel should look. O.O *gape* wow! thats all i can manage...Wow. very beautiful, hope a tree doesn't fall on it. this church is a beautiful sight and i like the way is designed. THE CHURCH IS A BEAUTIFUL SIGHT I REALLY ADMIRE IT I WISH I COULD HAVE BEEN A MEMBER OF SUCH A LOVELY CHURCH. this is at florida southern!!! I concure it is rather difficult to distingush the two. this glass church is soo beautiful! i wish i could go and visit it! Thanks for the correction. Beleve it or not I solicite corrections and any info you can give. I'm sure you have been told many times before, but this chapel is not by Frank Lloyd Wright but his son, also an architect and confusingly called Lloyd Wright.